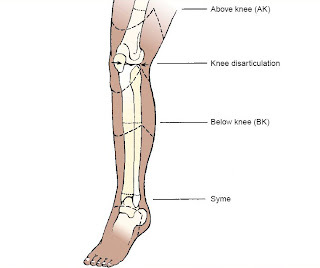 Amputation is the removal of a body part, usually an extremity. Goals of nursing care plans is relief of pain, absence of altered sensory perceptions, wound healing, acceptance of altered body image, resolution of the grieving process, independence in self-care, restoration of physical mobility, and absence of complications. Amputation is the surgical severing of any body part. Amputations can be surgical (therapeutic) or traumatic (emergencies resulting from injury) Amputation is used to relieve symptoms, improve function, and save or improve the patient’s quality of life. If the health care team communicates a positive attitude, the patient adjusts to the amputation more readily and actively participates in the rehabilitative plan, learning how to modify activities and how to use assistive devices for ADLs and mobility. Peripheral vascular disease is much more frequently the cause of amputation than are traumatic injuries. Poor foot care, impaired circulation, and peripheral neuropathy lead to serious ulcerations. 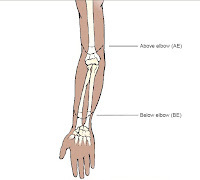 Congenital deformity, severe burns, and crushing injuries, Tumors (usually malignant) and chronic osteomyelitis that does not respond to other treatment may also necessitate amputation.